Just in case anyone had any doubts about it, I am a big fan of the Madden series. If you had any doubts, you can take a peek at my top Madden Moments here. I have a lot of them, having played the vast majority of the titles on one system or another. So with all of the fanfare surrounding 25 years of John Madden branded football, I had a lot of hope we would be seeing some serious throwbacks to some of the more important titles in the series. That hope found itself unfulfilled however, because this year felt more like the 'roster update and tweaks' kind of release that a lot of people complain about than usual. Another slightly annoying thing is that many of the features being touted for the Madden 25 release are the same (if not somewhat lacking when compared to) as those found near the end of the PlayStation 2 era. A buddy of mine pointed out that basically, if we had customizable plays we could design, we would be right about back to where we were about eight years ago with the franchise. That is not to say everything was bad - there are a lot of very good things in here as well. The question is whether or not this release has enough under the hood to recommend to most gamers. Madden football has become a very pretty overall game. Character models look good, and the updated Infinity Engine has fixed a lot of the weirdness we saw in last year's introduction to the system. 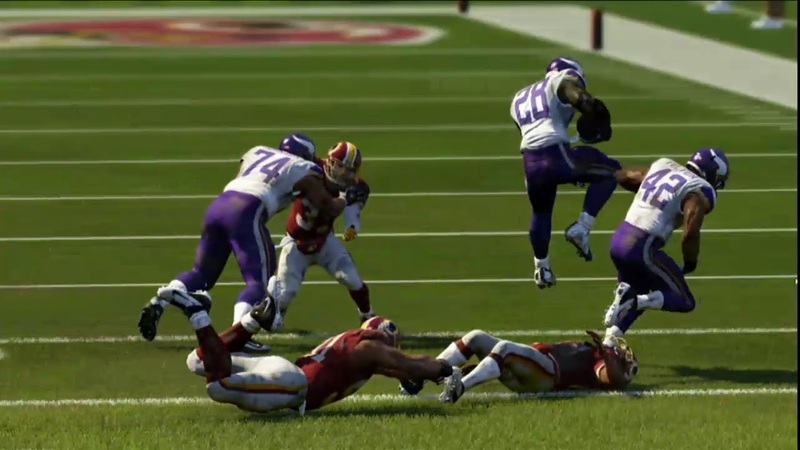 In Madden 13 we saw a lot of things like post-play tripping and running backs slamming into their linemen and falling down. There are still a few odd moments here and there, but the improvement is significant and the animations look far better than the canned stuff we saw for decades. There are a lot most interesting things happening in the passing game as well now, with the ball taking more bounces off of hands and shoulders and wide receivers and defensive backs sliding to the ground or making shoestring catches. The overall presentation looks really good, though the stuff on the sidelines is generally a bit bland, and the fans in the stands nothing to be excited about. The music itself would be fine if there was more of it - especially in the menu screens. The somewhat NCAA-like music sounds good at first, but you spend a lot of time in those menu screens - especially when you are tweaking stuff for a franchise. There is some licensed music for in the game itself, so it seems like more of it should show up outside of the game as well. More than that though, the audio commentary has just gotten really long in the tooth. Phil Simms and Jim Nantz are a pair of announcers that NFL fans are pretty well divided on, and while I do not mind them myself, a lot of their commentary feels recycled from prior years and often does not fit properly with the context of what was going on in the game. It is still better than a few years ago when the audio was essentially broken, but something needs to be done here. The new tweaks to the running game feel really good. At first they were a bit off, but the use of the left trigger and then a button press helps you spin and juke even more effectively than normal (though I question having the pitch button right next to it, as I have myself - and seen other players as well - accidentally hit the wrong button and create a silly turnover as a result. As mentioned above, the Infinity Engine's update was far better than last year's, and I have high hopes for it going forward. 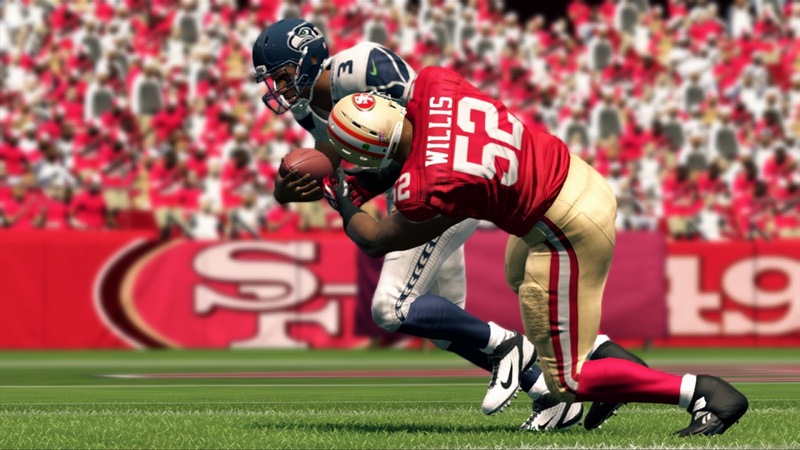 A lot of the features brought to Madden 25 are welcome, but they are not new - they are simply back from the last console generation. This includes the playbook editor, positional editing in the off-season and the owner mode. Thankfully the additions feel good, and the progression system I enjoyed for my players and coaches last year is tweaked and back. While the menus themselves are laid out logically, there is a bit of a hitch to them that I find somewhat annoying. It reminds me of the week advancement in NCAA football, where it feels like the system is simply trying to process too much content at once. Maybe this will be rectified next generation, but it is disappointing that this late in the current generation's life cycle that we are still seeing those kinds of occasional performance issues. The thing is, there is still a lot of football to be had here, and it is still a lot of fun. 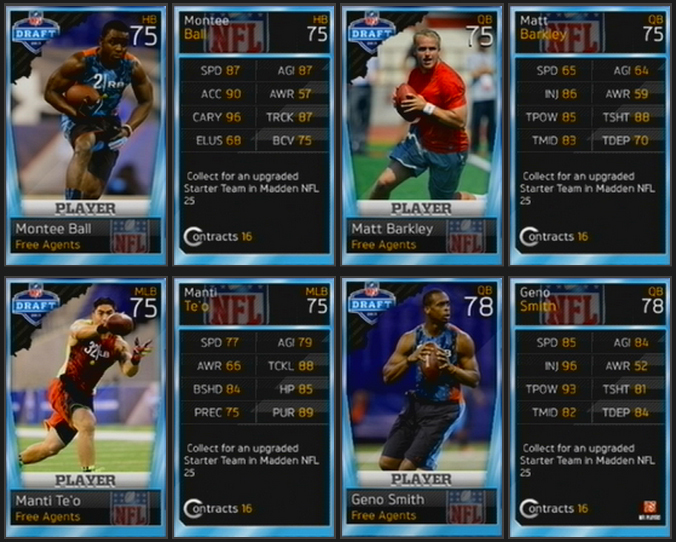 I really enjoy the Madden Ultimate Team - or at least the idea behind it. Collecting cards to fashion a team is fun, but the growth curve feels too slow - almost RPG grind-like. You can buy new packs of cards for coins you earn through play, but your team is really, really poor to start. Your computer opponents are generally 15-20 points better than your squad overall, and it shows on the playing field. EA is trying to get players to spend money on packs of virtual cards, and I am sure a lot of people will because the concept is interesting - but this is not a freemium game. People are already spending sixty dollars on it, so I have a slight issue with how the Madden Ultimate Team is structured. Thankfully there are other modes as well. The inclusion of the fantasy draft and local multiplayer franchise mode are welcome returns, and the franchise mode is as deep as ever. Deeper than the last few years, if you consider the Owner Mode now. I like that I can import my NCAA draft classes as well, though it is disappointing that the Draft Stories system does not interact with those classes. If you enjoy the Draft Stories, you will have to use the default Madden yearly rosters. The ability to upload and download rosters and playbooks is a nice touch, and uploading videos to the EA servers is as easy as ever (though why there is no image capture in Madden when NCAA has it is a mystery to me), so that helps with the sense of Madden community. No doubt the online Franchise/Connected Career Mode is where I will continue to spend a ton of time with my friends. Considering I was playing out my last Super Bowl against one buddy in Madden 13 just two weeks ago, this is a mode with some serious legs to it. So here is the thing - if you are a huge fan of the NFL or you have not picked up a Madden title in a year or two, there are enough improvements to probably make this one worth your while. I am the target audience and I have played dozens of hours in the last week and will likely be playing on and off for months to come with my friends. 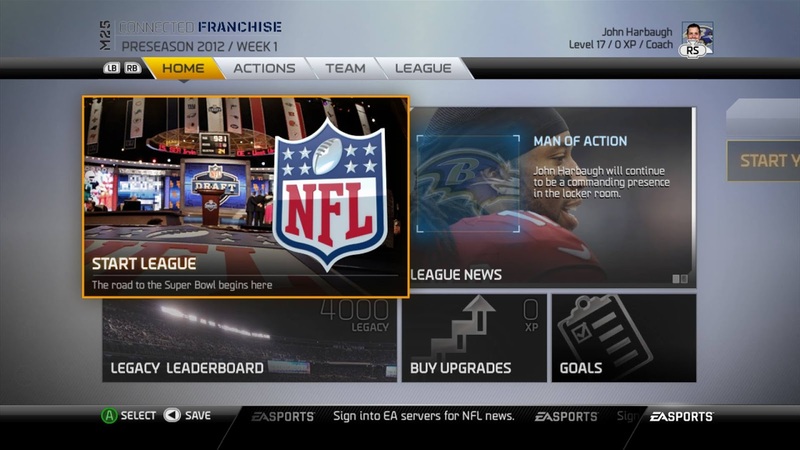 If you are a more casual fan or someone who feels that the updates to Madden do not generally require a yearly purchase, then I suspect Madden 25 will do very little to change your mind on that front. Also, this is a serious question, but if you pause the game and go to the replay feature...how close can you zoom in to the grass? Good enough to see the individual blades? I pick up a baseball game about every 2 or 3 years - usually MLB: The Show. I can't wait to see what that looks like on PS4 next year. Basketball is my favorite non-NFL sport, and while Madden is pretty much a yearly given, NBA 2K is almost every year - though I am curious to see how EA's NBA Live fares this year as well. I may have to try and get my hands on both. Question on the grass: no idea - but you know what? I'll try it tonight and see. My daughter likes commenting on the grass, so she'll probably be curious too. The sideline people are still holograms. we're closing in on Halloween though, so maybe we should go with ghosts instead? you know, just to be seasonally festive and all that. My favorite sport is football, but my last Madden game was an early-mid PS2 one. It was enjoyable, but I never felt the need to upgrade.